in the library of the Monasterio de San Lorenzo de el Escorial. of the Cathedral in Santiago de Compostela. 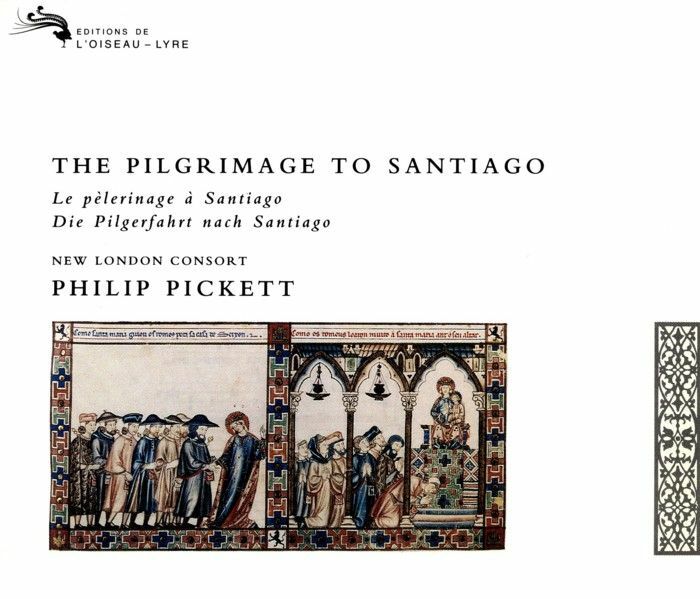 This is not the first recording of medieval music associated with the pilgrimage to Santiago de Compostela, and it will probably not be the last. In particular, this project owes a great debt to Thomas Binkley and Andrea von Ramm, whose recordings of this repertory had a profound influence on the early development of the New London Consort; and to Carlos Villanueva, director of the Grupo de Camara at the University of Santiago de Compostela, who unlocked many doors for us and made our visits to Santiago de Compostela not only more profitable, but also more stimulating and enjoyable. I would also like to express my personal gratitude to the librarians at El Escorial and Santiago Cathedral for allowing me considerable access to the precious manuscripts in their care. 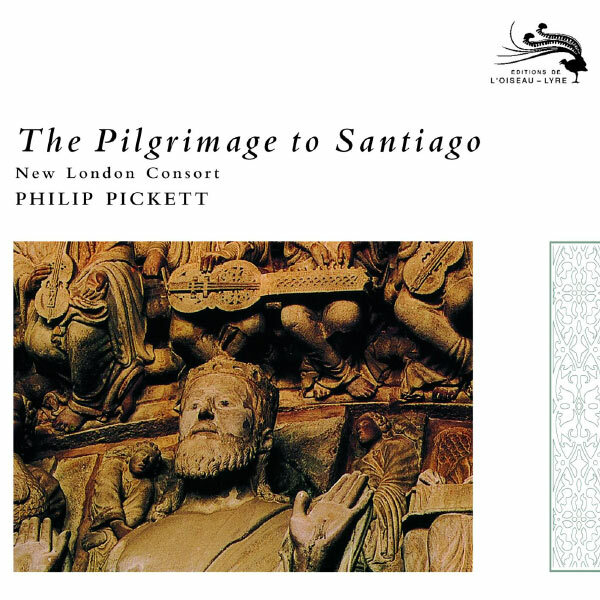 There are, of course, only a few songs which actually deal with Santiago, the pilgrims and the pilgrimage, and these appear on all the recordings. They are recorded here complete and uncut for the first time. This recording also introduces new sounds and new scholarship, and delves more deeply into the polyphonic repertories of the Las Huelgas manuscript and the Codex Calixtinus. Europe houses many shrines built in medieval times at the burial sites of saints or apostles, or at places associated with miracles performed by the Virgin Mary. In Spain, one such shrine was especially famous in the middle ages — Santiago de Compostela, in the north-west, where pilgrims came from all over Europe to worship at the grave of St James. The first Apostle to be martyred, James the Elder, brother of John and son of Zebedee, was possibly beheaded in Jerusalem by Herod Agrippa I in 44 AD. James was born in Jaffa. His mother, Mary Salome, was the sister of Mary, mother of Jesus, thus connecting him directly with the Holy Family. It has been claimed that before his death James preached in Spain, but St Paul, in his Epistle to the Romans 15: 20-24, suggests that Christ was not known in the peninsula. One source claims that the relics of St James were found in 813 in Padrón by the hermit Pelayo with the aid of a miraculous light, another that they were discovered in Lebredón in 847. The most common belief was that James had preached in Spain, following Christ's commission to preach the Gospel to the ends of the earth, and then returned to Jerusalem. After his martyrdom two disciples brought his body from Jerusalem to Padrón, where a shrine and succession of churches were built over the tomb. Whatever the truth of the story, the final resting place of the relics was called Santiago de Compostela — St James in the Field of Stars, surely a reference to Pelayo's miraculous light — and became one of the three main centres of Christian pilgrimage. Alfonso VI, Imperator Totius Hispaniae, provided the necessary funds for the building of a Cathedral dedicated to St James, as well as for the repair and maintenance of the principal pilgrim road — the Camino Francés. Work was begun on the Basilica in 1078 and completed in 1122. The famous Pórtico de la Gloria, the west door and façade, was added between 1166-88. The workmen who built the Cathedral were supervised by Frenchmen. By the 12th century four main pilgrimage routes crossed France, following Roman roads, and these met at Puente la Reina. 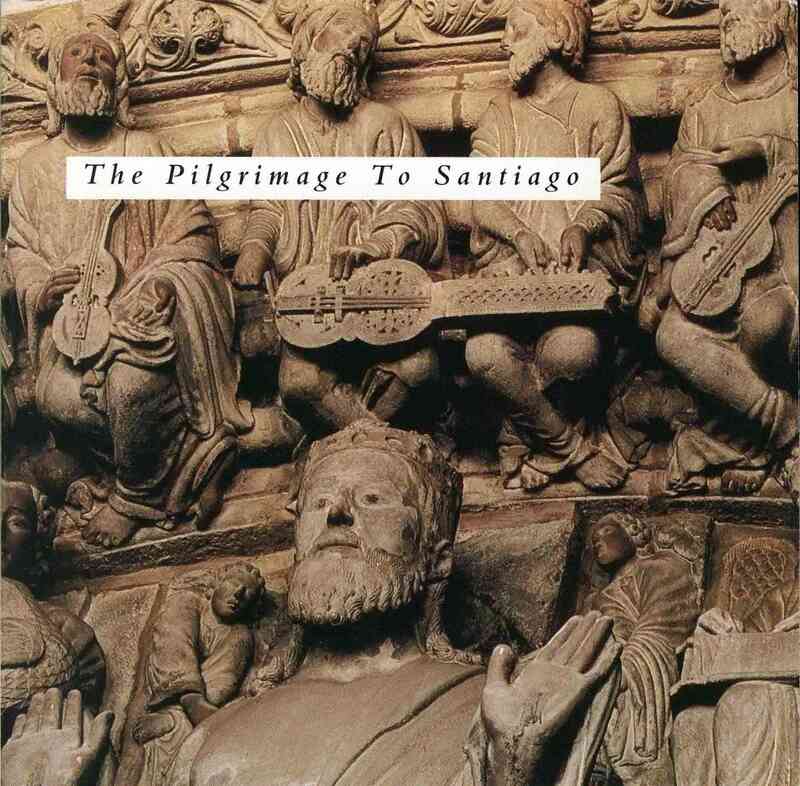 The journey from there to Santiago along the Camino Francés took at least eight days, and the pilgrims could stay at hospices, often monastic, some twenty miles apart along the way. They were entitled to free lodging and food, and were protected by civil law. Many adventures took place along the road, some of them requiring the help of the Virgin Mary. These are recorded in the Cantigas de Santa Maria, assembled between 1250-80 by Alfonso el Sabio, King of Castile and León. But not all the music of the Camino Francés tells of the miracles of the Virgin — there are also Latin conductus and motets, marching songs, love songs and laments. All the pieces on this recording tell of the pilgrims and their adventures, or come from the most important resting places along the way. The monastery of San Salvador de Leyre can be found just to the north of the pilgrim road that runs between Jaca and Puente la Reina. The Cantiga Quen a Virgen ben servira tells how the 10th century abbot, San Virila, spent 300 years listening to the song of a bird. This abbot was born in Tiermas and is known to have lived for some time at the monastery of Samos near Triacastela. He was buried in Leyre, but his remains were later moved to Pamplona cathedral. For travellers along the pilgrim road, Burgos was the most important resting place, with many hostels and favourable laws governing matters of special interest to them. The Codex de las Huelgas was compiled at the Cistercian Convent there. for Berceo it was a local miracle. The miracle described in the Cantiga De grad'a Santa Maria occurred before the altar of the church of Santa María la Blanca in Villalcázar de Sirga, once known as Santa Maria de Villasirga or simply Villasirga. This 12th century church contains the sepulchre of Don Felipe, brother of Alfonso el Sabio — an important connection between the Virgin and Alfonso's Cantigas de Santa Maria. Between Villálcazar de Sirga and León is the town of Sahagún. To the south lies the church of the Franciscan monastery La Peregrina, where the Pilgrim Virgin is venerated. The Cantiga Ben com'aos tells how she changed her staff into a ray of light to guide a band of pilgrims by night. It is impossible to pinpoint the exact location of the miracle described in the Cantiga A Madre de Deus, but the text tells us that it occurred in the mountains near to Santiago. The library of the great Cathedral of Santiago de Compostela today holds the famous Codex Calixtinus, the provenance and content of which seem to have been widely misunderstood for centuries. The manuscript contains a guide to the pilgrim road as well as music associated with St James and the pilgrimage. The seven Cantigas de Amigo of Martin Codax tell of a girl who sits on a hill overlooking the bay of Vigo. Although Vigo does not lie on the pilgrim road, it is only a little way from Padrón, where the body of St James is believed to have arrived in Spain. Monophonic song in Spain must be regarded as a direct outgrowth of the troubadour movement. From the time of William IX of Aquitaine contact between the ruling families of southern France and the Christian kings of Spain was frequent and close. The large retinues that accompanied these rulers on their many visits to each other naturally included troubadours and jongleurs, who also travelled widely on their own. French troubadours found a ready welcome at Spanish courts and Provençal became the language of poetry south of the Pyrenees until, in the 13th century, Spanish songs in the vernacular began to appear. Thus the Cantigas de Santa Maria originated in a cultured and aristocratic society which included troubadour song among its many amusements. Alfonso el Sabio (the Wise, 1221-84), king of Castile and León from 1252 until his death, was an enthusiastic patron of the arts and sciences and established an enduring cultural foundation for the future of his kingdom. He seems to have been particularly fond of poetry and music, and his court was not only a haven for French, Islamic and Jewish culture, but also a natural refuge for troubadours fleeing from the Albigensian Crusade against the Cathar heresy in Provence. In literature Alfonso regarded the Cantigas de Santa Maria as his finest achievement. Assembled between 1250 and 1280, this is a large collection of over 400 songs telling in a new way the traditional Marian miracles inherited from late classical Germanic and Romanic medieval Latin sources. No New Testament figure owes more to legend than that of the Virgin Mary. The Gospel account in which she rarely appears and still more rarely speaks must have seemed increasingly inadequate and so there arose in primitive times the apocryphal stories which later satisfied the medieval appetite for information about her. In Christian theology the cult of Mary began to grow in the 6th and 7th centuries. It made some headway in the circle around Charlemagne's court, and various Offices and Feasts were introduced into the Liturgy during the 9th and 10th centuries, but the worship of the Virgin remained little more than a variant of the cults of the individual saints, holding no special significance until early in the 11th century, when the popular Marian legends began to be written down. These were further assembled into collections in several countries during the 12th century, each collection being given a title such as ‘Miracles of the Blessed Virgin Mary’. From then on the cult developed quickly — the Office of the Virgin was recited daily, the greatest cathedrals were built in her name, the dogma of the Immaculate Conception was anticipated and the new Orders, the Franciscans and Dominicans, spread her cult among the people. The poems collected by Alfonso were all written in Galician — considered by Spanish poets from the 13th to the 15th centuries as the most suitable language for lyric poetry, and probably chosen by Alfonso not only because the Cancioneros of the Galician minstrels had already proved that Galician was best for the creation of a universally understood lyric epic, but also to link his collection with the vernacular repertory associated with Santiago de Compostela. The texts of the Cantigas are extremely vivid and down-to-earth. Alfonso makes use of local oral traditions, and even, he claims, of his own experience — often distinguishing wonders read about from those heard and seen. The Cantigas recount household tales and widespread legends, honour foreign shrines, tell of pilgrims journeying to Spain, and refer to England, France, Italy and other countries. In every case the Virgin appears at a crucial moment to dispense mercy and justice. Delight and belief in the miracles may have been genuine enough, but the detailed accounts of Boccaccio-like situations that call for Mary's intervention suggest that audiences and performers alike enjoyed the sins at least as much as the salvation. It may be a coincidence that some of the stories are set in Soissons, home of Gautier de Coincy, but Gautier's Miracles de Nostre Dame had certainly established a recent literary and musical precedent for the Cantigas and the idea of the collection as a whole must surely have owed a debt to Gautier. Even the structure of the Cantigas is reminiscent of Gautier's epic. Gautier's Miracles de Nostre Dame form a massive verse narrative of some 30,000 lines recounting the miracles associated with the Virgin. He explains that he found these stories in a Latin manuscript. Several such sources survive, but it is impossible to trace the origins of all the material contained in his work. The Miracles was written between 1214 and 1233 while Gautier was Prior at Vic-sur-Aisne, and survives in more than 80 manuscripts. Gautier incorporated a number of songs with music into his long narrative, and 22 of the surviving sources include melodies for them. These songs appear at various points in the text and are mostly new poems in praise of the Virgin set to pre-existing melodies from a variety of sources, including monophonic and polyphonic works associated with the repertory of Notre Dame in Paris. They constitute the earliest substantial collection of sacred (and above all, Marian) songs in the vernacular. In contrast, other trouvères produced an almost exclusively secular repertory. Alfonso's Cantigas de Santa Maria have survived in four lavish manuscripts. Three contain the same poems and melodies, with a few exceptions and minor variants; the fourth contains only poems — staves had been drawn in preparation but the melodies had never been added. Every tenth poem in the collection is a song in praise of the Virgin (Cantiga de Loor). The regularity of this arrangement — so reminiscent of Gautier's plan — is broken only at the beginning of the collection, where a sung Prologo precedes the first Cantiga de Loor, and at the end where a Petiçon follows the last. In the manuscripts the songs are carefully numbered; rubrics identify the subject of each, strip-cartoon-like series of beautiful illuminated miniatures tell the story of each miracle, and miniatures depicting musicians playing or tuning a wide variety of instruments accompany each of the Cantigas de Loor. 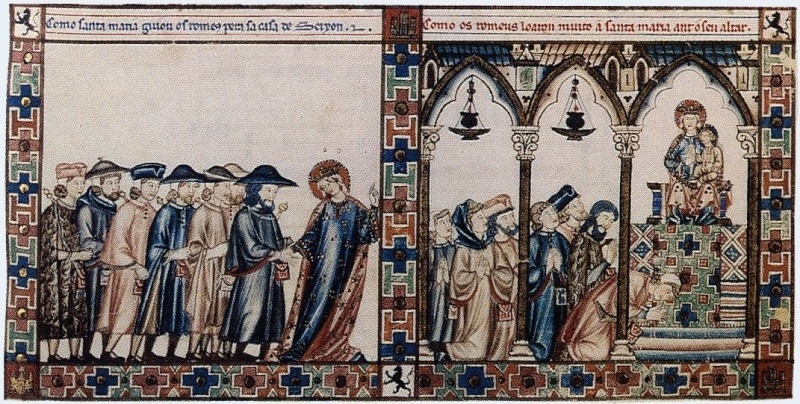 These pictures differ in the various manuscripts, with the exception of those depicting Alfonso himself, all of which concur in showing him as supervisor of, or instructor to, clerical and secular scribes who are compiling the Cantigas while minstrels tune up or wait. Taken together, the miniatures supply exceptionally accurate and indispensable information about the instruments in use at Alfonso's court — more than forty different kinds in all! Interestingly, Moors, Jews and women are shown playing them as well as aristocratic and rustic Hispanic figures. There is some disagreement as to whether Alfonso merely supervised, or wrote some of the words and music himself. The manuscripts state several times that he ‘made’ certain Cantigas, and in some he speaks in the first person. On the other hand, in his General Estoria he explains that ‘the King writes a book...in the sense that he gathers the material for it.. adapts it, shows the manner in which it is to be presented and orders what is to be written’. Whatever the truth of the matter, Alfonso and his team certainly borrowed a number of well-known songs of the day for the Cantigas melodies, and evidence shows that these were mainly drawn from French-based sources on both sides of the Pyrenees. Of the tunes so far identified, some are trouvère songs, some come from the Notre Dame repertory, some recall songs of the troubadours and some are even reminiscent of the few extant notated dance tunes. Las Huelgas, a Cistercian convent near Burgos in Old Castile, was founded by Alfonso VIII, famous for his victory over the Moslems at the battle of Las Navas de Tolosa in 1212. The Codex de Las Huelgas was compiled for the convent around 1300, and has remained there. It is especially important as the first major source to be wholly notated in mature Franconian notation, the unambiguous nature of which can be remarkably helpful in parallel transcriptions and analogous interpretations of the remainder of the (more ambiguously notated) repertory. Most of the music dates from the late 13th century, but there are some earlier pieces and some early 14th century additions. A large number of pieces derive from the repertory of Notre Dame, and some exist elsewhere in other versions with different texts: Surrexit de tumulo is a contrafactum of Exiit diluculo (Carmina Burana I); Verbum Bonum is the original of the parody Vinum Bonum (Feast of Fools); and the 3-part conductus motet Alpha bovi also exists as a three-part clausula, a two-part motet and a monophonic song by Gautier de Coincy. Interestingly enough the tenor is not quite the Domino tenor. It seems to have been altered in a few places to fit the melody, suggesting that the melody was a pre-existing folk tune and someone realised that the notes of the Benedicamus Domino tenor could almost be fitted to it! Several polyphonic works are known only through this source and are possibly Spanish in origin, though they display clearly the close connection between the peninsula and France — examples here are Belial vocatur, an unusual 4-part motet; Ex illustri, a rare duple-metre motet honouring St Catherine; and Fa fa mi fa. It has also been suggested that many of the texts are in fact products of Spain. They are often unique to this source, or have concordances only in other Spanish manuscripts, so it would seem that a school of Spanish poets flourished in the 12th and 13th centuries who were well aware of the subject matter and techniques employed by their contemporaries in France. The Codex contains 45 monophonic and 141 polyphonic pieces covering a wide range of styles — motet; conductus (Surrexit de tumulo); sequence (Verbum bonum et suavi); conductus motet (Belial vocatur/Tenor, Ex illustri, Alpha bovi/Domino); a solmization exercise (Fa fa mi fa/Ut re mi ut); trope (Agnus Dei/Regula moris); Sanctus setting; gradual; alleluia; and four unique planctus or laments. The first of these, Plange Castella, was written on the death of Sancho III, father of the convent's founder Alfonso VIII. When Sancho died the kingdoms of Castile and León were divided between two sons. Rex obiit, the third lament, was written to honour Alfonso VIII himself, and Quis dabit capiti meo acquam was perhaps written for his grandson Ferdinand, later to be canonised. The last planctus, O monialis concio, laments the death of an Abbess of Las Huelgas — the rubric reads De dompna Maria Gundissalvi de Aguero, abtissa et nobilissima super omnes abbatissas. Known to all as either the Codex Calixtinus or the Liber Sancti Jacobi, this source, now held in the library of Santiago Cathedral, is described by its author simply as Jacobus. The contents of Jacobus include, in five books, a letter fictitiously attributed to Pope Calixtus II, the supposed editor of the manuscript; the story of Charlemagne's peers attributed to an Archbishop Turpin of Rheims; 22 miracles of St James; the Legend of St James; what can only be described as a 12th century guidebook for pilgrims on the road to Santiago; and finally, in Books I and V, incipits and music for the Office and Mass, monophonic and polyphonic conductus and versus — a large number of chants and polyphonic settings which have long been regarded as a selection from the early musical repertory of the Cathedral of Santiago de Compostela. But it is now widely accepted that the manuscript was in fact an all-purpose teaching manual belonging to an itinerant French grammar and music master and his usher, which also embodied the contributions of a succession of such masters. The script, decoration and text of the main body of the work is French, though some have argued that the musical notation is Spanish. It was probably copied at or near Vezelay, and one Aimeric Picaud (thought to be the schoolmaster's usher) was probably the composer of some of the polyphony. The other pieces are all attributed in the manuscript either to unknown composers or to composers associated with Paris and Notre Dame — Magister Airardus Viziliacensis, Magister Gauterius, Ato Episcopus Trecensis and Magister Albertus Parisiensis are the names attached to the four conductus recorded here. In fact, it seems that the history of the contents of Jacobus may have begun at St Jacques de la Boucherie, Paris. The master is thought to have taught at a school connected with St Jacques, then gone to Cluny, where apparently not all his work was approved by the monks. The manuscript, already quite unusual in its scope, is full of deliberate and learned distortions of grammar, rhetoric, theology and logic, all to be spotted and corrected by students; and on closer examination it seems that the services contained in Book I are for secular, not monastic, Offices; the presence of an abnormal number of Benedicamus settings (for use at the end of lessons?) would support the idea of use in school. Whatever is intentionally wrong with any of the items ascribed to Calixtus himself, there is nothing wrong with the music, though theories that it was meant specifically for use at Santiago cathedral are not tenable. Most of it would be suitable for school music teaching and worship, and some of the service music of Book I seems to belong to a kind of altemative Feast of Fools, celebrated by the master and his students either at Second Vespers on 30 December, the Feast of the Translation of St James, or on 25 July, the Feast of the Passion of St James. Even the Pilgrim Guide was designed for teaching, filled as it is with bad Latin, quotations to be spotted, geography lessons and schoolboy howlers; and the guide covers the same ground again and again, each time the journey having a different secondary theme. At least the guide appears to be written from firsthand experience. Whoever wrote it probably visited Santiago on business rather than as a pilgrim around 1130, possibly in connection with the administration of a grammar school in Santiago. The original material for Jacobus was probably collated by 1140, and though many later copies have been identified — all more or less incomplete — it would seem that the manuscript held in Santiago Cathedral is the archetypal fair copy. Appended to the Codex are several leaves, almost certainly Spanish in origin. One of the last, possibly older than the rest, contains the Latin pilgrim song Dum pater familias. It was probably well-known and, like the French material, seems to have had some didactic intent — St James's name appears in several cases of the first declension: Jacobus, Jacobi, Jacobo. It seems that most of the Codex, including the polyphony, was present in Santiago by 1173, when Arnaldus de Monte, a monk of Ripoll, made a copy of it. He says that he found it ‘In Ecclesia’ — which, given all the Spanish additions, probably meant that the volume was in possession of a schoolmaster at a grammar school in Santiago, a school very possibly connected with the Cathedral. If in fact Jacobus does not contain a special Santiago repertory, then what is the justification for including the musical works here? There can be little doubt about the relevance of the pilgrim song Dum pater familias. As for the polyphonic works, I would suggest that at least some parts of the Codex were of special interest and importance to the Spaniards. Whatever the provenance of the material, the texts deal with St James and the music is of a high standard, so it would be surprising if the works remained unknown; and we can never know how many of the French pilgrims to Santiago had received at least a part of their education from the pages of Jacobus. The polyphony of Jacobus has presented musicologists with serious problems in the interpretation of its rhythms because they attempted to apply the complex rules of quite unsuitable modal or mensural rhythmic systems to a much more simple style of notation. In fact, individual voice-parts display a clear similarity to the syllabic style of the troubadour chanson. The occasional melismas, reminiscent of those found in the high-style chanson, also reflect the flowing discant of the St Martial repertory. Vertical lines in the manuscript help align voices, notes and text. The need to apply too many complex rules would have made it quite impossible to perform the music from the notation, but the most obvious and simple approach works so well that it is difficult to imagine any other solution! Each syllable or melisma takes one beat, with the occasional lengthening of a note to accommodate more than one (clearly defined) melisma in the other part. The seven Cantigas de Amigo of Martim Codax, the 13th-century Galician juglar, are the earliest surviving examples of Iberian secular music. Codax was possibly connected with the court of Don Dinis of Portugal. His seven poems appear in two manuscripts, one of them in the Vatican, but both without music. In 1914 the Madrid bookseller Pedro Vindel discovered a third manuscript in the binding of a 16th century copy of Cicero's De Officiis. Here at last were melodies, though incomplete and corrupt, for six of the Codax Cantigas. The parchment is torn and some of the notes are missing or blurred, but it is clear from the notation that it dates from around 1300. The scribe drew the staves for the sixth song, but unfortunately did not fill in the notes. The songs in this manuscript appear in the same order as in the others, suggesting a definite cycle — not a narrative, but variations on the same theme, and possibly the first extant song cycle. Although Vigo does not lie on the Pilgrim Road, it is only a little way from Padrón, where the body of St James is believed to have arrived in Spain. But for us there is a far better reason for including the cycle here — these seven tiny, simple and repetitive songs are among the most passionate and moving pieces we have ever performed, and the cumulative effect of the cycle is utterly devastating. Et... vigintiquattuor seniores ceciderunt coram Agno habentes singuli citharas et phialas aureas plenas odoramentorum, quae stint orationes sanctorum. These ‘citharas’ were interpreted very freely by the medieval artists and sculptors, but normally they were shown as stringed instruments. The twenty-four Elders so brilliantly sculpted by Mateo on the great Pórtico de la Gloria of Santiago Cathedral play fiddles, gittems, harps, rottas, psalteries, knee fiddles and, in the centre of the semi-circular ensemble, an organistrum or two-man hurdy-gurdy. I have long been fascinated by the make-up of this particular medieval orchestra. Not only are the stone carvings of the instruments incredibly detailed and accurate, but there is also a certain sense and symmetry in the make-up of the group. One cannot always dismiss medieval iconogaphy as artistic licence and symbolism. True, pictures of music-making appear more realistic when fewer musicians are involved, but I think it is dangerous to insist that any large group of musicians — be they Angels or Elders — are unlikely to represent actual medieval orchestras, but only symbolize heavenly music to the glory of God. Surely some artists depicted instrumental ensembles with which they had been familiar. Nimio gaudio miratur, qui peregrinantum choros circa beati Jacobi altare venerandum vigilantes videt: Theutonici enim in alia parte, Francia in alia, Italia in alia catervatim commorantur, cercos ardentes manibus tenentes; unde tota ecclesia ut sol vel dies clarissima illuminantur. Alii citharis psallant, alii liris, alii timphanis, alii tibiis, alii fistulis, alii tubis, alii sambrecis, alii violis, alii rotis Britannicis eel Gallicis, alii psalteriis, all diversisi generibus musicorum cantanda vigilant, alii pecuntur diversa genera linguarum, diversi clamores barbarorum loquele et cantilene Theutonicorum, Anglorum, Grecorum, ceterarumque tribuum et gentium diversarum omnium mundi climatum. In this wonderful description of the pilgrims singing and playing around the altar of Santiago Cathedral during the feast day vigil of St James, the list of instruments played together by a large group of international participants includes harps, lyres, drums, shawms, flutes, trumpets, fiddles, British or French rotes and psalteries. Such spontaneous music-making must have been informal, but, assuming a common repertoire, reasonably successful and impressive! Now this description may have been exaggeratedly all-embracing for effect, but even today in Morocco traditional ensembles consist of large numbers of violins, some lutes, a rebab and percussion. So for this recording I brought together what must be one of the largest medieval ensembles of modem times (certainly the largest collection of medieval fiddlers) in order to reproduce the make-up and sound of the Pórtico de la Gloria ensemble as closely as possible. Given the limited availability of good specialist players and instruments, it is as well that not all twenty-four Elders on the Tympanum are actually holding instruments! One of the most important constituents of the group must be the organistrum, and I was fortunate to enlist the aid and instrument of Mary Remnant, music director of the Confratemity of St James and one of the greatest authorities on the pilgrimage, its music, instruments and architecture. Four 3-string ‘8-shape’ fiddles or medieval viols flanked the organistrum, two on either side, then psaltery, zither (substituting for the medieval rotta), harps, gittems, and finally 5- and 3-string harps, gitterns, and finally 5- and 3-string fiddles played at the shoulder. What should the ensemble play? The most apt work in the repertory, Dum pater familias, also presented the best material for such an ensemble — certainly the melody offers many opportunities for embellishment and the improvisation of extra parts and fuller textures. Did the experiment work? We all feel that it did, and not just well, but to an astonishing degree, as did the use of large forces in other carefully chosen works. It seemed natural, in the light of the description in Jacobus and the size and make-up of some modern ethnic ensembles, to employ the fiddle band in a few of the Cantigas de Santa Maria, with and without other instruments and voices. De grad'a Santa Maria and Non e gran cousa have been discussed elsewhere, but it is worth pointing out here that the (unperformed) texts of Non sofre Santa Maria and Por dereito ten a Virgen, two Cantigas played by the fiddle band alone, concern pilgrims on the road to Santiago; and the wild instrumental prelude and interludes of Non e gran cousa are based on Cantiga 77, Da que Deus mamou, which tells of a miracle at Lugo, a town situated a little to the north of the pilgrim road soon after Triacastela in Galicia. It is now a main centre for the manufacture of the Galician bagpipe known as gaita, to be heard throughout the region and particularly in Santiago. Gonzalo de Berceo took his name from the village where he was born and where the monastery of San Millán de la Cogolla is still to be found. He never left his native region, retaining strong connections with the monasteries of San Millán and Santo Domingo de Silos, but was well enough educated to be highly regarded by his fellows. He wrote at a time of ecclesiastical retrenchment — the Church was actively strengthening its sway by reaching the people through a revival of interest in local shrines — and his works include Vidas and miracles of local saints and of the Virgin Mary. He loved and respected the people and managed, through his writings, to enlighten their confusion concerning doctrine and scripture. Many links connect European secular music of the middle ages with music of the world of Islam. These influences came through contact with Persian scholars, through the Crusades and through the Moorish occupations of Spain and Sicily. It was particularly apparent in the western adoption of instruments such as the lute, rebec, shawm and nakers. In the Islamic tradition, music functioned chiefly as a carrier of text. Improvised accompaniment was an important ingredient of performance, and elaborate procedures were developed for making a large and complicated work out of relatively simple strophic material. Accompaniments were not written down, but devised by the performer to suit the character and subject matter of the text. The format of the Arabic Nuba is an excellent example of how a ‘complete’ performance of a medieval song could have been constructed, particularly in a region like Spain which had close links with Arabic culture. First we might hear a free instrumental improvisation where the musician checks the tuning, establishes the tonal centre and possibly introduces fragments of the material to be performed. This is immediately followed by a more rhythmic and coherent introduction, and when at last the attention of the audience has been successfully attracted the song begins. Soon there is a change to more instrumental music (an improvised interlude), then the song again, and so on until the conclusion. Although we read of simpler and less organised styles of performance in the more northern reaches of Europe, many medieval writers tell of singers accompanying themselves with harp or fiddle, and improvising preludes, interludes and postludes to their songs. As to the general question of instrumental involvement in the performance of monophonic song, it is essential to approach the problem from the points of view of style, function, geography, and in particular genre. Although the evidence is fragmentary it is possible to deduce discernible patterns — certain genres are particularly associated with instrumental participation, while others are not.